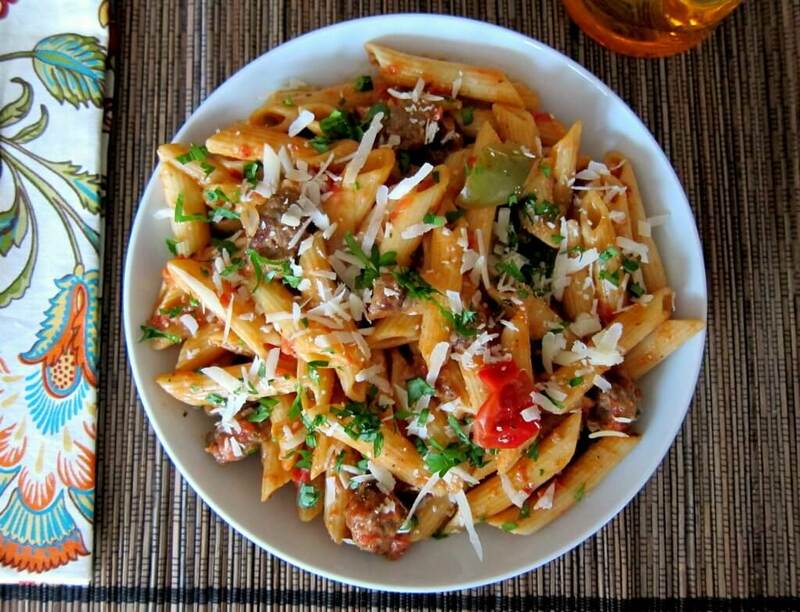 Tasty Penne with Sausage in Tomato Cream Sauce is quick and easy. The pasta and sauce are cooked together from scratch, which saves time. On a really busy day, you can make a home-made Instant Pot pasta dish within 30 minutes, with just 10 minutes hands-on time. Can you cook pasta in an Instant Pot? The answer is a resounding ‘yes.’ This penne with sausage in tomato cream sauce is a recipe I’ve been making for many years, but I’d never tried it in the Instant Pot before. Instant Pot pasta can be touch-and-go if you’re adapting your own recipe for the first time. The hardest thing to know is how long to cook pasta in an Instant Pot. 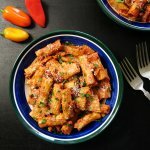 Thankfully pressure cooker bloggers like Barbara from Pressure Cooking Today and Laura from Hip Pressure Cooking have paved the path for us to learn from them and use their techniques to create our own Instant Pot pasta recipes. In this case I used Barbara’s Bow-tie Pasta recipe as a guide to convert my own penne with sausage recipe into an Instant Pot pasta recipe. I basically combined my homemade pasta sauce recipe with my Penne with Sausage recipe (which I’ve not posted on the blog) and it turned out great. I keep reading about how we Instant Pot users have become sort of cult-like, enthusiastically promoting the Instant Pot to anyone who’ll listen. Well, this recipe is an example of why we evangelize! On a really busy day, I was able to create from scratch (well, umm, except for the pasta part), a home-made Instant Pot pasta dish within 30 minutes, that fed my entire family. And the hands-on time was less than about 10 minutes. And I didn’t need to watch the dish. Just left it and went about my business; came back when the timer went off. A salad and some fresh bread and voila! A meal that everyone loved. Read on for a step-by-step guide on how to make this Instant Pot pasta recipe. I think that any substantial pasta like penne, farfalle or ziti works best for this Instant Pot pasta recipe. Keep in mind that I cooked this with penne pasta and the timing worked perfectly for it. Gluten-free or thin pastas will not work with these timings; you’ll have to experiment with the timings. You can substitute broth for the white wine. Be sure to deglaze really well after sauteing onions and garlic. Turn off the Instant Pot and let it cool down for a minute or two after deglazing. When adding ingredients before pressure cooking, add water first, then remaining ingredients except for tomatoes and pasta. Then add tomatoes and pasta and don’t stir; just push the pasta down with a spatula, and let it submerge in the water. If you’re new to the Instant Pot and aren’t familiar with how to use it, please read the Instant Pot DUO Beginner’s Quick Start Guide or the Instant Pot ULTRA Beginner’s Quick Start Guide first and then come back here to learn how to make Instant Pot Pasta. Deglaze pot with white wine, stirring until liquid has nearly evaporated. Add in bell peppers, sugar, dried basil, dried oregano, salt, black pepper, tomatoes, water, and pasta. Stir to combine. The display will count down from 5 to 0; it will switch to ‘Keep Warm’ mode and display ‘L0;00’. Press ‘Saute’ and simmer the pasta and sauce for a couple of minutes until heated through. Sprinkle each serving with grated parmesan, parsley and crushed red pepper, if using. 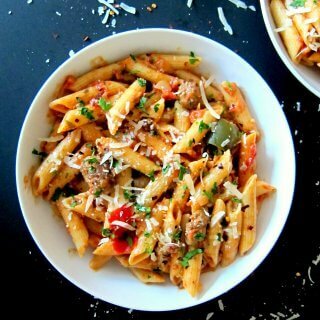 Tasty Penne with Sausage in Tomato Cream Sauce is quick and easy. This Instant Pot Pasta can be ready in 30 minutes with just 10 minutes hands-on time. Add in bell peppers, sugar, dried basil, oregano, salt, black pepper, tomatoes, water and pasta. Stir to combine. Close Instant Pot Lid, and make sure steam release handle is in the 'Sealing' position. Cook on 'Manual' (or 'Pressure Cook') mode for 5 minutes. Do a Quick Release of steam, and open the Instant Pot. Stir in cream and simmer the pasta for a couple of minutes until heated through. Turn off Instant Pot and if desired, let the pasta rest for a few minutes to absorb any remaining liquid. Sprinkle each serving with Parmesan and parsley, and red pepper flakes, if using. To lighten the dish, you could substitute half-and-half for the heavy cream. The sugar adds a nice balance to the flavor of the tomatoes, but feel free to leave it out. I am all about delicious, fast, and easy. Thanks for this awesome family-friendly recipe. Thank you for sharing Neena!!! I just got my IP yesterday and this is the first recipe I tried. I had to make a few substitutions bc I didn’t have some ingredients (I used linguini and red wine) but it worked out great and it’s delicious! I set the timer to 3 minutes for linguini and it was perfect. Michelle, I get paid in comments so your comment was like gold! I am really glad it worked out for you. And thanks for mentioning your timings for linguine – that’s going to help someone else. I think you’re going to love your new Instapot as much as I love mine! Laurie, comments like your’s make my day! Thank you for the feedback. Do sign up for my newsletter (at top of page) if you’d like to be notified of new recipes. And let me know any requests. Enjoy your new Instapot! I still don’t have an instant pot but thanks to you it’s looking more and more like I’m going to have to get one. I imagine the manual mode cooking part drives some of the aromatic flavour into the pasta but I think this recipe would work nicely adapting it to “old fashioned” cooking techniques. I’m going to try it anyway. This recipe combines the pasta sauce and dish into one recipe. To do it the regular way, you can make your favorite pasta sauce (or use my recipe on this site) and cook the pasta separately before putting it all together. I’m so happy I found this recipe. Thank you! It was absolutely the bomb! First time cooking pasta in my new IP! Hi Tammy – thank you so much for taking the time to comment. Hopefully it will be the first of many successes! I want to make this with leftovers – do you think I could double it? And then would I need to adjust cooking time since the pot would be full? You can increase the recipe, but I’m not sure you can double it. You shouldn’t go past the half fill mark to leave room for expansion. You increase the quantity of liquid by the same ratio as the pasta. So if you’re doubling the pasta, double the quantity of liquid. Cooking time stays the same. Hope that helps, feel free to contact me if you have further questions. This worked awesome with 12oz. Gluten free pasta for 4 minutes as well as adding a 1/2 cup of water. Thanks for sharing that, Kim. That’s really helpful for others who might want to use gluten free pasta. Thank you Kim. I am gluten free and really appreciate when others share how they adapt recipes to gluten free. My favorite IP dish so far! Thanks Tom! It’s so nice to get comments like your’s – they are why I love working on this blog and creating recipes! Sorry really new at this. Does the uncooked pasta not get added in step 6? I would have thought it needed more cooking than just a quick simmer at the end? Please help I already started cooking! Thanks ? Yes Hayley, your instinct is right; it does get added in step 6. It cooks under pressure with the tomatoes and other ingredients. It’s listed at the end of the ingredients list. Enjoy! I am brand new to the instant pot world, but purchased the mini (3 quart) size. I’m guessing I would cut this in half? Thank you! Hi Melissa, thanks for your question. So, there are a couple of considerations for adjusting quantities: only fill pot to halfway mark for pasta, rice, beans, anything that can expand – for safety reasons. Also, make sure you have enough liquid to reach pressure. Normally when you’re reducing the recipe, cook time doesn’t change. However, because the mini is smaller and different wattage, I’m not sure if you’ll need to adjust the cooking time. I would try it with the stated recipe cook time and then you’ll know what you need to do for next time. Let me know how it goes! Heavens, this is a keeper! Thank you for the great recipe. Made some subs, but was perfect! Hi Tricia – I’m so glad you enjoyed the recipe. Thanks for your comment. Made this tonight as my second official instant pit meal and it was absolutely delicious! The saucers flavor was amazing! Next time I want to try it with hot sausage! I didn’t have any heavy cream so just subbed while milk and melted butter. Can’t wait to see what other recipes you have ? Hi Amanda! That’s great – you’re going to love the Instant Pot, I can tell. If you like Cajun/spicy food, try the Jambalaya. It’s very good and quite popular. Also Shrimp and Grits. And thank you so much for taking the time to comment. Comments are the highest payment I can get, and keep me going! First dish with the instapot and it was unbelievable. I couldn’t stop eating, or marveling at the one-pot dish. Hey Bill – thanks for commenting and I’m so glad you liked the recipe. I just had this the other day! We made this recipe with a vegetarian ‘Italian sausage’ and it turned out great! Excellent! That’s great to know – thanks for sharing. This was absolutely delicious! I used coconut milk (from a can) rather than the heavy cream because we are a dairy free household! Still delicious! I also didn’t have white wine, and wasn’t sure what deglazing meant, so I just added some vegetable broth ? ?‍♀️ This was my first ever instant pot meal and I’m officially hooked! Gayleen – I’ve never tried coconut milk with pasta, sounds intriguing – I”m glad you had a success with your first Instant Pot meal – thanks for taking the time to comment! My first attempt in the Instant Pot and it’s wonderful! Your step by step instructions were so helpful! Delicious! Can you substitute whole where penne? Would it change anything? Danielle, I haven’t made this dish with whole wheat pasta but I would add a minute to the cooking time. Hey Rebecca, thanks for checking in. I haven’t used smoked sausage for this particular recipe, but you should be fine substituting without making any other changes. Just make sure you deglaze the pot well before adding the liquid and pasta. Enjoy your new IP! Hi Deb, I love the flavor of coconut milk but I agree that it would probably really change the flavor of this dish. How about a lactose free half and half? Keep my posted on what you end up using and how it went! I love this recipe and I am officially an instant pot believer! I do think I could have cooked my pasta for an even shorter time, it came out well done, so I’ll keep that in mind for next time. A meal that cooks in 3-4 minutes is amazing! Hi Ellen – I’m glad you’ve become a convert 🙂 You’ll probably have your own take on most recipes. Glad it worked for you, and thanks so much for commenting! This was seriously good. 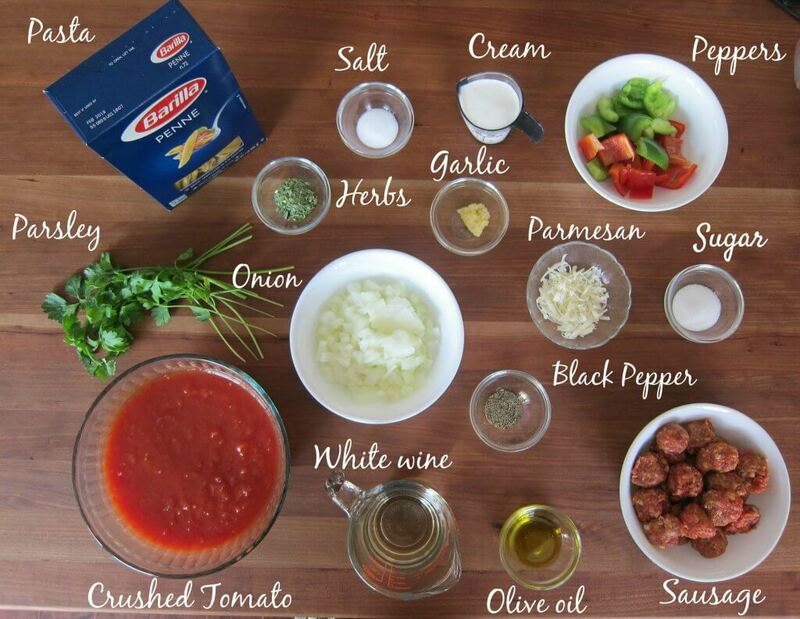 Use a great tasting Italian sausage as that is the flavor that carries the recip. Thanks, Kris, for commenting! Yes, very good point. As always, quality of ingredients really make a dish! I have learned from many lovely Italian ladies to use a carrot instead of sugar in a spaghetti sauce. Try it, it is much healthier . Hi Renee – thanks for the tip, it’s always nice to eat healthier! IP newbie here – only used it a few times – going to make this tomorrow but don’t have white wine. What would you suggest instead to deglaze? Chicken broth? Want to make sure I don’t burn the pasta! Hi Olivia, thank you for your question. You can substitute with extra broth. Hope you like it. Follow up – this is AMAZING. Thanks for your quick reply. Both hubby and I loved this. Will definitely try more of your recipes! Hi Olivia – Glad it worked out for you, thanks for letting me know! I’m new to the IP and your recipe and directions were great. My whole family loved it. The only downside is there were no leftovers and not much for seconds. I wish the recipe could be doubled. Thanks! Donna, if you have an 8 quart, you should be able to double the recipe. Increase the pasta to 1 lb and the liquid to 3 cups and cook for the same amount of time. Thanks for your comment and I’m glad your family enjoyed it! Do you mean double entire recipe or just the pasta and water. I tried doubling entire recipe and it turned out like soup. Gillian, I’m sorry you had trouble with the recipe being doubled. I did mean double the entire recipe, but I personally haven’t tried doing that for this recipe. Normally with this recipe, there is extra liquid at the end, but it gets absorbed after resting for about ten minutes or so. Did you find that it was too liquidy even after some resting time? Had my sister last night, who’s a new IP owner and very skeptical. She watched while I made this for the first time. End result: she took my recipe and the leftovers home. I had to come back to the site to reprint it. I think we’ve converted her. Woo hoo, Janet – way to go bringing people over to the IP cult 🙂 Thanks for sharing and I’m really glad you like the recipe. I got the burn signal. I opened and added more water. I followed the recipe to a t. Not sure what happened. I have an 8 quart. I only used a half pound of penne. ? Janice, I have a feeling it’s the 8 quart. I’ve been getting messages from people with the 8 quart getting the burn notice lately on different recipes. It probably has to do with the larger surface area of the bottom of the pot and liquid evaporating. I would say to increase the quantity of broth next time by 1/4 to 1/3 cup. The presence of crushed tomatoes in the recipe is probably causing this problem, so put the tomatoes in last and don’t stir. I hope that helps. Patience, next time add a bit more water and I think that will keep it from sticking to the bottom. Make sure you deglaze really well beforehand. I’m a little late to the IP world, but what a life changer! Your recipe was the first 😉 and it is positively delicious!! I have an 8qt and followed the directions you posted when replying to others. I’m happy to report that doubling the liquid did the trick (no burn alert). I used hot Italian sausage because my hubby loves it spicy and he was a very happy (stuffed lol) camper! He’s even taking the leftovers to the firehouse tomorrow :)). Thank you for sharing this yumminess with us! Hey Katie – thanks so much for sharing. I’m glad it worked for you and you liked it – your comment made my day! 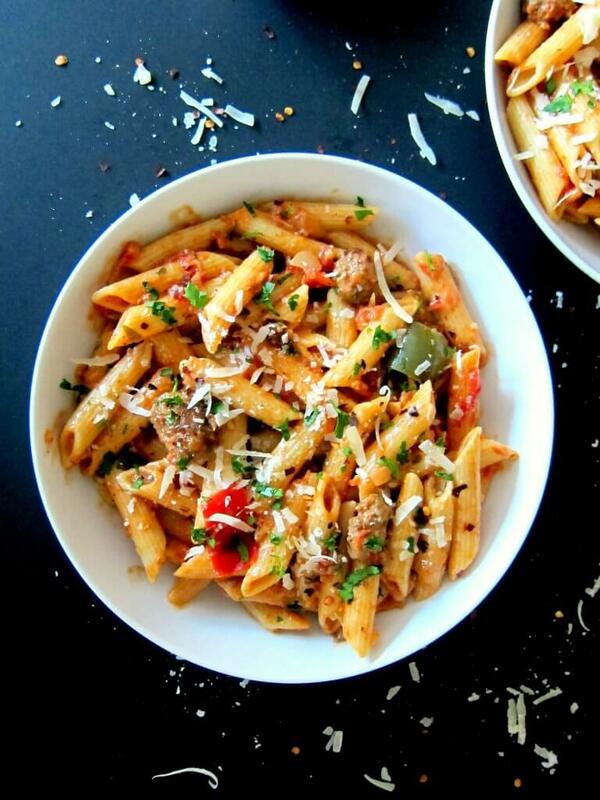 The flavour is amazing, but my pasta wasn’t cooked enough…I mean, almost hard penne! I was surprised by that when I opened it up. I’ve added a bit of water and it’s on a low saute so hopefully that will finish it up along with a lot of stirring to prevent it from burning on the bottom. I’m cooking in an 8 quart and followed your extra instructions. Looks like I’ll have to add more cooking time the next time around! Hi Thalia – are you using normal pasta or is a special kind, maybe whole wheat or rice? If it’s regular (semolina) pasta, based on what you’ve told me, it very much seems like your Instant Pot was not sealed. I could see it being al dente, but to still be hard after cooking for the stated time makes me a bit suspicious that it didn’t come to pressure. If that is the case, you probably need to increase liquid, especially since you have an 8 quart. Any suggestions on what I can substitute the italian sausage with to make this pasta vegetarian? Thanks – looking forward to trying this. I’m glad it worked for you Dhanya! I want to make this one-pot pasta for vegetarian friends. I am thinking of just substituting the sausage with sliced crimini mushrooms because I remember that this pasta was quite flavorful and I think too many veges are not needed to make it taste great. The bell peppers add some nice color to the pasta later. So I can sauté the onions and garlic to begin, then add the mushrooms and sauté until cooked. Then I deglaze with white wine and follow the rest of your given recipe. Do you think that it will work with the pressure cooking? Any suggestions will be very welcome. Thanks much ? Hi Dhanya – yes, I think that would work. Have you ever considered the soy ‘ground beef’ (e.g. smart ground brand). I’ve not tried in the IP but it’s a great substitute for meat. I used whole wheat pasta, increased pressure cooking time to 6 mins. and it turned out great! Also, added one package of button mushrooms, sliced and replaced wine with chicken stock. Will add this recipe to my go-to-recipe list! Thanks for posting your comment and review! Most importantly, thanks for giving timings that worked for you with whole wheat pasta. That’s helpful to other readers! I am searching all of your recipes, and have a comment and questions for another one besides this one. I am hooked. We don’t use sausage in my house. I know the cooking times would be different, but what about cubed chicken? Hi Trudy – yes, you could use cubed chicken and it would work just fine. 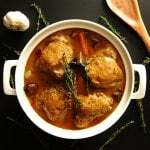 I don’t generally use chicken breast but rather thighs in my IP recipes – they cook up more tender. These are absolutely the best directions I have ever read! Thank you sooooo much! Being a beginner with IP I’m a little nervous and have such clear guidelines, including picture, ,Ames this recipe a breeze! I can’t wait to try this. TONIGHT! Good luck Sheri! I just made this yesterday. If you have an 8 quart, read the special instructions I’ve posted above the recipe card. This was my first time trying pasta in my new 3 quart Instant Pot and it turned out perfectly. It was so delicious that I have sent the recipe to my son who is also a new pot owner. Thank you April – that’s the best compliment! Glad it worked for you. I’ve been in love with my instant pot for a while, but was too scared to try making pasta in it. I made this tonight and it was MARVELOUS!! I added in fresh, sliced zucchini when I added the cream and that worked out perfectly too. Cooked the veggies al dente – just like I like them – without having to sauté them separately. This recipe will be added into regular rotation for sure subbing in different meats, veggies, etc. Excellent! Thanks so much for sharing! Nicole – you’re so welcome – I like your addition of veggies at the end, great way to make it healthier. Thanks for your lovely comment! Thanks for a great recipe. Easy to follow, make a delicious. I used sausages, cut into bite size and instead of cream, I finished it off with cream cheese. The whole family enjoyed it….creamy, perfectly cooked and seasoned. Thanks Lynn! Cream cheese works great especially if your pasta is more watery at the end. This can happen if you’ve added more liquid to prevent the ‘burn’ message. Mascarpone cheese also works well. Thanks for sharing. I made this Sunday and loved it. Very flavorful. I added some mushrooms I had on hand and instead of heavy cream I added Newman’s Own Alfredo Sauce. Thanks for a great recipe.. Thanks for commenting, Rita. I’m really happy you liked it. This is our favourite instant pot recipe by far!! My son’s ask for this weekly! 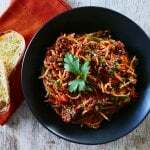 It’s also our go to recipe when unexpected company stops in – with 4 sausages, a box of pasta, and organic fire roasted crushed tomatoes , it easily feeds 5 with some crusty bread and a salad!! My most used recipe so far! Love love!! Thanks for this recipe! It was my first IP recipe after hard-boiled eggs and it came out excellent! My husband has asked that this be put on our rotation. Hi Deb – I’m so glad y’all liked the recipe and that it was a good first experience! I tried this pasta today with soy crumbles instead of sausage. My Instant Pot did not come to up to pressure. But the timer began counting down and the pot beeped when it was done. I think maybe the sealing ring may not have been seated properly; i’m not sure why it didn’t come up to pressure. I had deglazed it well before pressure cooking and I don’t think there was too much liquid in the pot either. While sauteing the soy crumbles the pot looked like it was getting burnt at the bottom, so I deglazed with a little water until it browned well, and then added the wine. Then proceeded with the rest of the steps.. In the end, the pasta was cooked fine, but it looked like it had too much sauce that thickened up a bit after sitting for a while on the countertop . It turns out, I cooked a modified vegetarian Bolognese pasta!! Hi Dhanya – I think the problem was the soy crumbles. Next time, cook them, deglaze and remove. Then add them back in on top of the pasta and don’t stir in. It was probably scorching on the bottom. Thanks for sharing. I love my Instant Pot, but being of Italian descent, I have been skeptical about trying pasta, presuming it would be too mushy. Your recipe convinced me to take the plunge, and this recipe did not disappoint! My husband and I both loved the dish, and it is definitely a recipe I will consider a “keeper.” Next time, I intend to cut the water down to 1 cup so the pasta isn’t quite as saucy…but I do realize that is a personal preference (my husband loves his pasta on the sauce-y side) and your flavors were spot on. Thanks for helping this ital-gal add pasta to her Instant Pot repertoire! Hey Renee! Coming from an Italian, that’s a great compliment. When you reduce the quantity of liquid, just make sure you have enough for the pasta to be covered with liquid and of course, come to pressure. Thanks for your comment, and glad you liked the recipe! Wow! This was a big hit with everyone in our family. Even our picky 10 year old. One thing – is there a typo in the recipe? It says “1 tbsp” of garlic, but the picture looks more like 1 teaspoon and you usually follow the convention of capitalizing the ‘T’ for tablespoons (i.e. Tbsp). Hey John, good catch! It is tablespoon, I’ll capitalize the T. For my tastes, 1 tsp of garlic does nothing especially in the pressure cooker 🙂 I’m glad you liked the recipe. You might want to check the pictures on your pins. Several have the coq au von picture, including this pin. Thank you Donna – that’s so kind of you to take the time to let me know! Pinterest can be buggy sometimes, or I’ve made a mistake – I’ll take a look. This was easy to make. Tastes great! I added 1/2 c of water when I added pasta. This recipe was great because I’m diabetic and many are too high in carbs, fat, and calories. It fit into my meal plan ? Thanks, Karen, for your comment – I’m so glad you liked it. Delicious! I mixed in some chopped spinach and mozzarella cheese at the end. My 2 year old twins couldn’t shovel it into their mouths fast enough! Hi sorry if this has been asked already but there were a lot of comments. Do you put the uncooked pasta in after the first pressure cook and then pressure cook again? Or put cooked pasta in and let it boil a bit? Or put uncooked pasta in and boil? To me it sounds like the third option from your directions but I feel like that wouldn’t cook the pasta. Theresa, your guess was right. You put in uncooked pasta, and it will pressure cook for 5 minutes. And yes, it will cook 🙂 Good luck! Hi Linda – this is an adaptation of a stove top recipe. I use this sauce. I made this for dinner tonight. I didn’t have the sausage so used ground beef and followed the recipe exactly as printed. I couldn’t believe how easy it was and it turned out great. This recipe is a keeper. Can’t wait to try more of your recipes. Thank you, Christine. I’m glad you found me and I hope you like my other recipes! I made your red beans and rice recipe last Sunday, and tried this one today. Both were so good! I’m so glad I found your site! Clearly, “Paint the Kitchen Red Sunday” is going to have to be a tradition in my house so I can try all of your recipes. Thanks! Made the pasta with Italian sausage, peppers and penne. I already had roasted and peeled peppers and used mini penne so cooked for 4 minutes. It came out perfectly. Elise, thanks for your comment and review and for sharing your modifications!